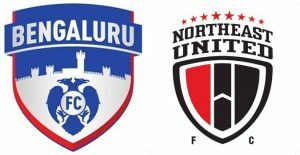 Super sub Chencho nets winner as Bengaluru FC down NorthEast United FC! Home / Indian Football / Indian Super League / Super sub Chencho nets winner as Bengaluru FC down NorthEast United FC! Chencho Gyeltshen scored his second goal for the Blues, yet again off the bench versus NorthEast United FC, as Bengaluru FC returned to winning ways in the Indian Super League with a hard-fought 2-1 result at the Sree Kanteerava Stadium in Bengaluru on Wednesday. An own goal from Mislav Komorski (41′) was cancelled out by Federico Gallego (60′) early in the second half, only for Bhutanese striker Chencho to score the winner in the 71st minute. Bengaluru FC are masters of the set-piece and they laid stake to the claim with a perfectly worked routine that put them ahead in the 14th minute. With four people over a free-kick close to forty yards out, Dimas Delgado rolled ball to Sunil Chhetri who peeled away from the crowd in the box before lifting it over for Udanta Singh down the right. Mislav Komorski couldn’t do much with the sting that the Bengaluru FC winger’s cross had, and ended up turning the ball into his own net. Chhetri then had the chance to make it two when he brought down a long goal kick from Gurpreet Singh Sandhu in the 33rd minute. But the Bengaluru FC captain’s decision to square the ball to Udanta instead of attempting to curl past T.P. Rehenesh, seemed to being the wrong one. With nothing to boast about in the opening thirty minutes, NorthEast United FC upped the ante in the hunt for the equaliser. But the Blues’ defence refused to give ISL top scorer Bartholomew Ogbeche any room to conjure a revival. The one time Mato Grgic managed to get a header on target, Sandhu didn’t have to break a sweat to tip it over. It took a lapse of concentration from what was an otherwise solid defensive performance from Bengaluru FC till the 60th minute, for NorthEast United FC to claw back into the game. A harmless looking lob from a throw-in near the half-line saw Federico Gallego sprint between Juanan Gonzalez and Alberto Serran before finishing calmly past Sandhu to make it 1-1. The equaliser saw NorthEast United FC with their tails up and it took two fantastic saves from Sandhu to deny Ogbeche first and then substitute Panagiotis Triadis from one-on-one situations, in a space of four minutes. Bengaluru FC, looking for a response, found one in the 71st minute when Juanan headed Rahul Bheke’s long throw in to substitute Chencho who fired home from close to make it 2-1. The win sends the Blues back to top spot with 30 points, three more than second placed Mumbai City FC. Kerala Blasters visit the Fortress on February 6 in the Blues’ next game of the campaign. Previous Title contenders Churchill Brothers & Real Kashmir FC face off at Tilak Maidan! Next XtraTime VIDEO: Mohun Bagan only draw against Gokulam Kerala FC!